“Walking is a refreshing alternative to complicated aerobic routines and overpriced gym memberships.” It is a free and enjoyable activity that is already a part of everyday life. All anyone needs to do is practice the correct techniques, add a little more speed and a little more time to your walking and you will see yourself begin to lose weight. 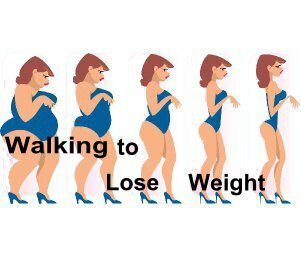 How to walk for best weight loss results? Can Walking Alone Lose Weight? There is actually quite a bit of evidence that leans towards the benefits of walking. Scientists at the University of Pittsburgh recently found that overweight study subjects who walked briskly as their form of exercise for anywhere from 30 to 60 a day, showed signs of weight loss without changing other lifestyle habits. Adding just 30 minutes of brisk walking to your day can help you burn up to 150 more calories than you would if you did not do physical activity. 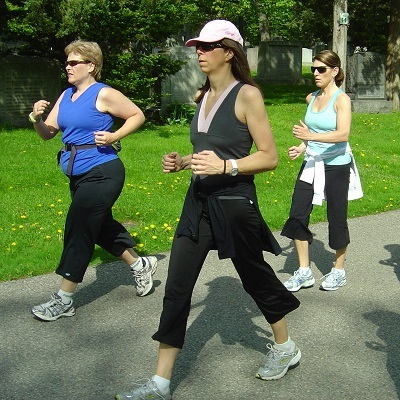 Be sure to add intensity to you walking gradually. The faster your pace and the more you move your body, the more calories you can burn during your workout. Keep a balanced pace and do not try to overdo yourself. Injury can happen when you least expect it and will definitely throw you off if you’re on a fitness and weight loss plan. Work on building up your endurance over time to be able to handle more vigorous workouts. How Can You Walk to Lose Weight? Walk instead of drive from your home to meet your spouse or friend at the store. Say you can walk 2-3 miles, draw a loop that maps out that distance around your house and try the different routes that can take you to different stores and establishments. Some people don’t feel they have the time to exercise, but think of what you do: grocery shop, visit the ATM, go to the post office. Grab a bag to carry and walk to the places you need to go. Most people live within walking distance of their local grocery store or bank. If you drive to the store, park as far as you can and walk briskly both ways. Break your habits by walking different paths or directions on occasion. Walking in the reverse direction not only kills boredom but can strengthen your physical balance. Go left at the end of your street instead of right. Make an effort to notice new things in the surroundings. The emotions you feel will help you to keep a quicker pace while you walk and, in turn, the walking will help you release some of your stress hormones. Take a friend so you can have someone to burn off steam with. 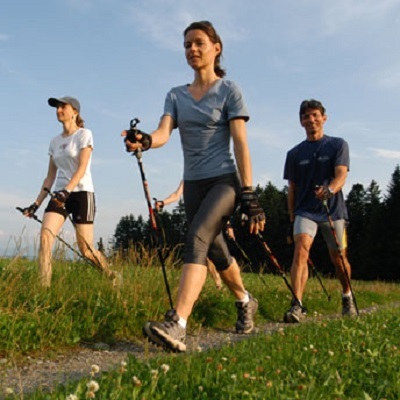 Using ski-like poles for this exercise causes more arm and body movement to help burn extra calories while you walk. You are pushed to pick up the pace and workout harder without you even realizing it. On average, people burn 20% more calories when they use poles. Add hills to your route or workout to increase the overall calorie burn. When you go downhill you get an even better workout on your leg muscles as they contract to slow your descent and work against gravitational pull. Softer surfaces require more energy than something like a sidewalk, as they mould with your foot. Every time you step down, you push that much harder to lift your leg again for the next step. Walking on rocky or uneven ground can offer even more benefits to muscle strength and physical exertion. Physiologists at the Oregon Research Institute have done studies that found walking on cobblestones can lower blood pressure and improve balance. Uneven surfaces are thought to stimulate acupressure points on the soles of your feet which regulate overall blood pressure. 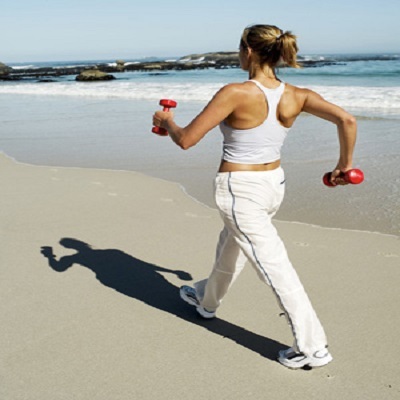 The challenge of uneven surfaces also helps burn more calories. Do a workout that involves essential upper body shapers. Use small weights to tone arms, shoulders, chest and back. Engage in steady 4 mph walk. You can do a 45 minute block or 15 minute sets. Try to achieve one mile per 15 minutes - a very fast pace! 45 minute “burn and firm” workout to burn calories and firm muscles. A steady 4 mph walk. Try to go the full 45 minutes rather than in sets. Essential upper body shapers workout. An OFF day. Let your muscles and joints relax and recuperate. For best results, don’t sit on the couch - go for a very slow, leisurely stroll to keep the joints lubricated and muscles relaxed. 45 minute burn and firm workout. Steady 4 mph walk for 60 minutes; choose between walking straight through the whole hour or do 2 sets of 30 minutes at a brisk pace.